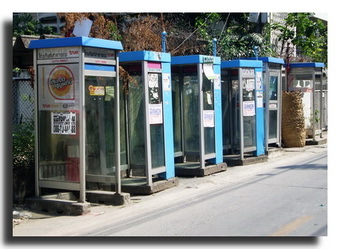 The communication network in Thailand is very simple to use for tourists and other visitors. There are numerous telephone booths on every main street. If you are looking for a mobile phone, you can get it easily. Post offices and internet cafes for internet are available too, but you can also surf with your own smartphone. Thailand offers reliable wireless internet services. Calling or surfing, the communication network in Thailand allows everyone to keep in touch easily with friends, family members or business partners. The telephone system in Thailand is very modern and widespread. Pay phones can be found all over the country and work fine. The reception is very good, except you are staying on a far away island or in the isolated mountainous regions of Thailand. GSM-compatible mobile phones can be used in Thailand because there are GSM 900 and 1800 networks. New and second-hand Thai phones with SIM-card can be purchased cheap and simply. You can buy SIM-cards directly at the airport after landing or later in one of the supermarkets close to the hotel where you are going to stay. With a Thai mobile phone you can call home very simple and comfortable. But also your friends can call you in Thailand on this mobile phone from abroad. You should only be informed about the international country code for Thailand. Thailand's international country code is +66. Calling to another country from Thailand, you should use the code 001 plus the country code of the country you are calling to.